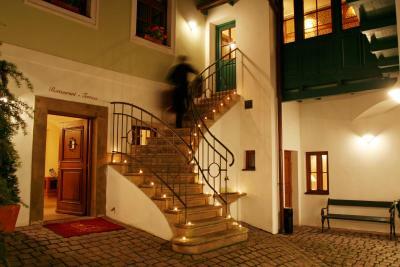 Lock in a great price for Golden Well – rated 9.7 by recent guests! Excellent service in great location - it felt more like a home than a hotel - highly highly recommend staying here. The Golden Well Hotel was very quiet but near everything. 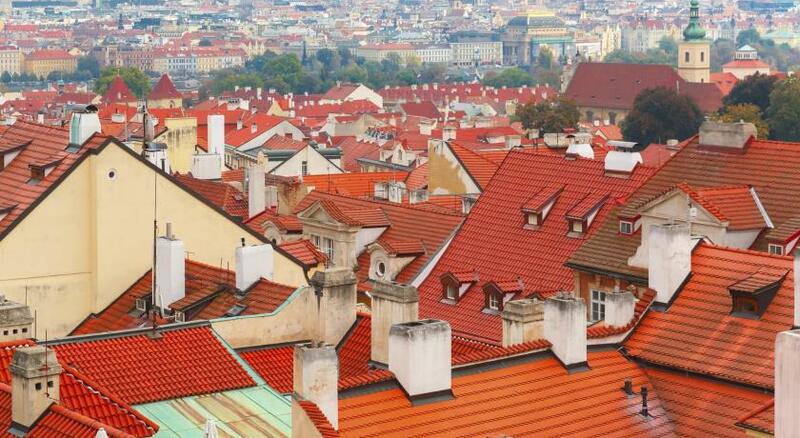 We had a beautiful view of Prague. 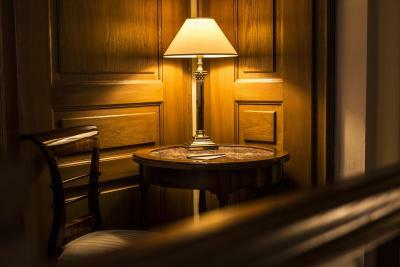 The room was elegant and had all the modern conveniences. The staff were friendly and very helpful. This was such a delightful experience all around, that it would be impossible to find one thing about which to complain. Golden Well has thought about every possible need a guest could have and addressed it. I especially liked the time planned in the early evening to mingle with other guests over a glass of wine. They were all very interesting and as delightful as the hotel. On quiet street, but close castle hill and many choices for restaurants. Quiet location in the center of everything. 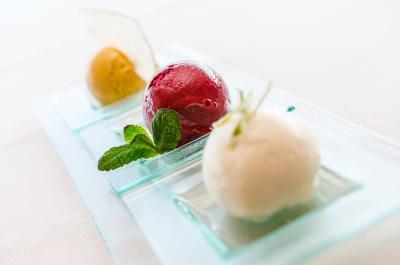 Perfect attention to detail and service. 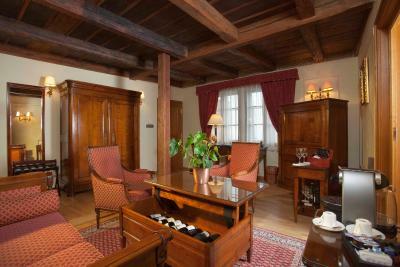 Cozy quiet hotel with great service and a great location, albeit a 10 minute walk to the main square. 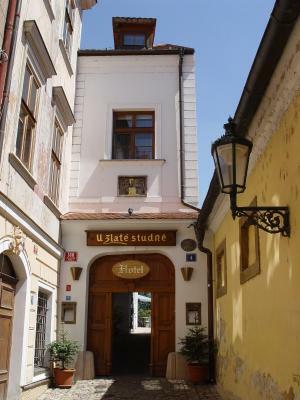 This is a really unique property, located up a narrow, pedestrian only street in the Mala Strana district of Prague just below the Prague Castle complex. We were only a few minutes walk from the east end of the Castle and from the Malostranske subway and tram stops. 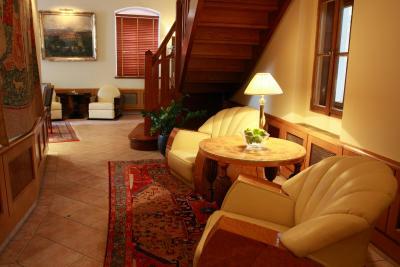 This is a great place to stay, in the heart of the diplomatic quarter, quaint and peaceful. 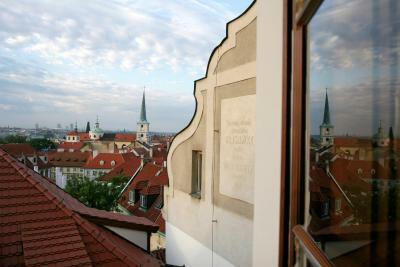 Views from our room looked out over the neighboring gardens with a panoramic view south to Prague's old town. 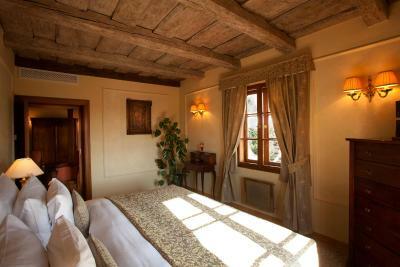 Our room was quiet, had its own vestibule entrance, a large bedroom and bathroom, all beautifully decorated. Helpfullness and friendliness of the staff. 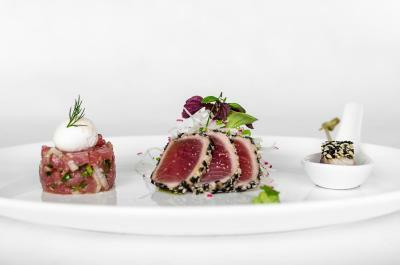 The breakfast and restaurant service. Nothing is to much trouble. Views unbelievable, staff lovely ! First class hotel. Room beautiful and large. Provided free iPad and iPhone. Restaurant A+. Golden Well This rating is a reflection of how the property compares to the industry standard when it comes to price, facilities and services available. It's based on a self-evaluation by the property. Use this rating to help choose your stay! 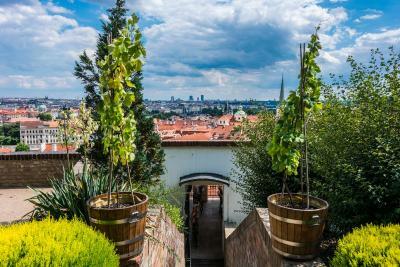 The boutique Golden Well hotel is in one of the best locations in Prague, with Prague Castle right next door, a 10-minute walk from Charles Bridge and 3 minutes from Lesser Town Square. 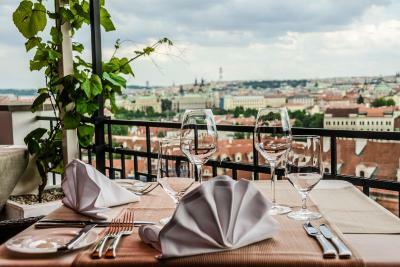 Overlooking Prague's romantic rooftops or the Royal Gardens, the comfortable rooms have air conditioning, a minibar and satellite TV and an Apple TV. 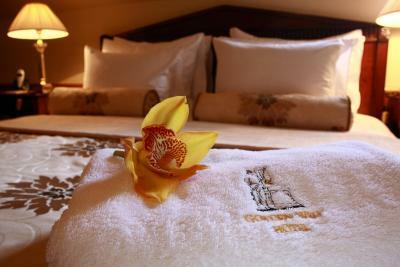 The bathrooms are provided with bathrobes and slippers. 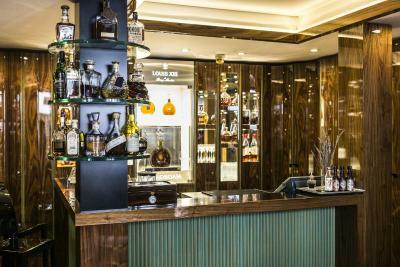 Guests are welcomed with a drink and complimentary shoe-shine service is provided. 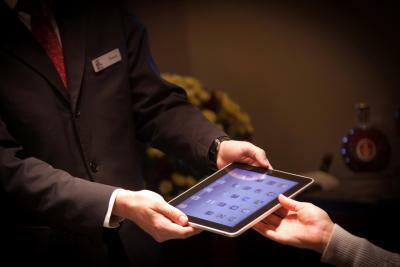 Free Wi-Fi access, a DVD library, luggage packing and unpacking, as well as an evening turn-down service, are just 4 of a great range of luxurious amenities available at the Golden Well hotel. 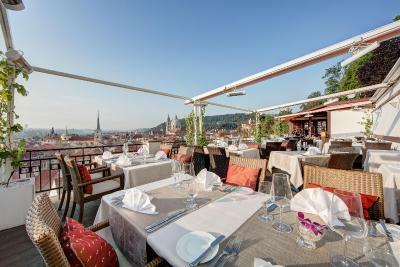 The restaurant, which is decorated in an elegant style with elements of the Renaissance era, is on the 4th floor. 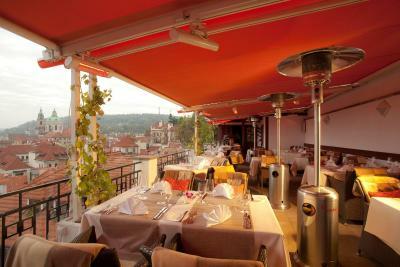 Guests can enjoy breathtaking views from the open-air terrace of the Golden Well. 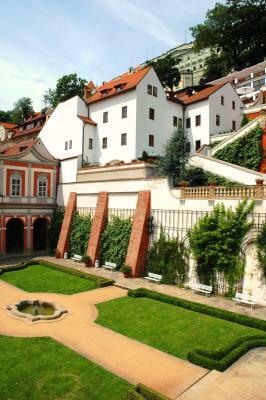 After lunch, a walk in the Royal Garden of Prague Castle (during opening hours) can be enjoyed. When would you like to stay at Golden Well? 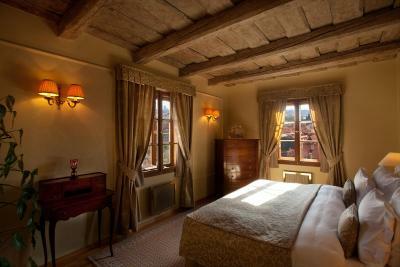 The Superior Rooms provide splendid views of the Royal Gardens or the charming cobblestone courtyard. Cozy yet spacious, they have a large desk, an armchair and an Apple TV. You can choose between a queen bed or 2 single beds. 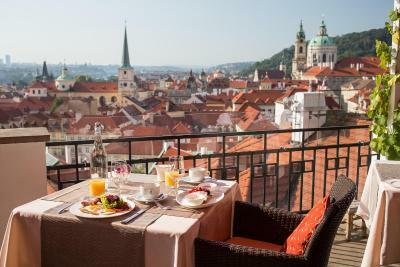 Overlooking Prague's romantic rooftops or the Royal Gardens, these comfortable rooms are everything you wished for your stay in the City of Hundred Spires. 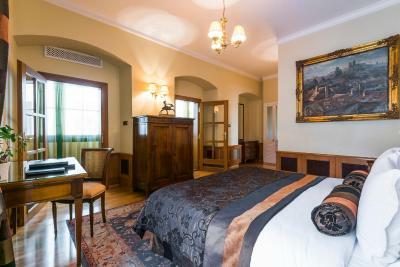 Equipped with a king bed and an Apple TV, they are the perfect base for your adventures in the beautiful city of Prague. 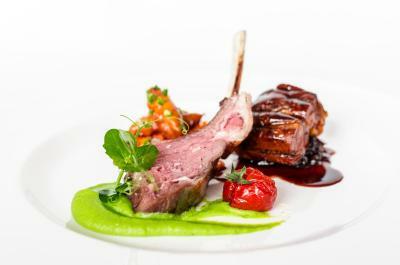 Step into another world and experience the taste of luxury and beauty. 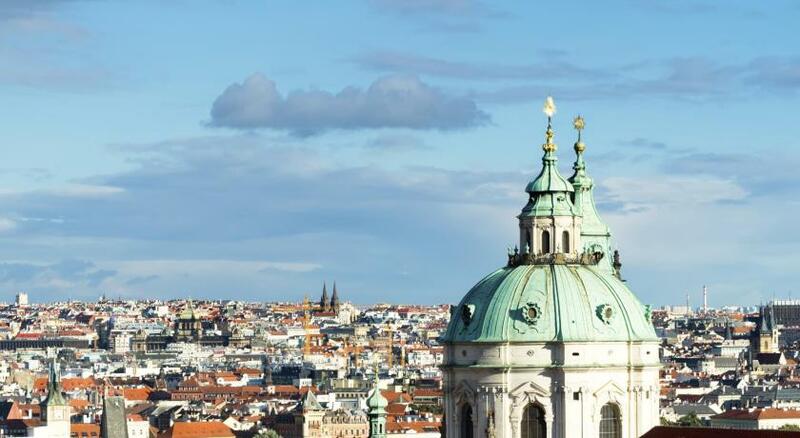 Rudolf II Suite's opulent furnishings and spectacular views of Prague's skyline will make you feel like royalty and delight your senses in every way. Separate bedroom and living areas ensure that you will always have plenty of room. 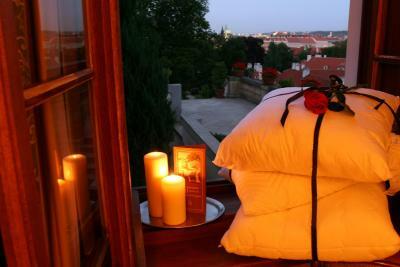 Ideal for a romantic getaway, the Tycho de Brahe suite features breathtaking views of the Royal Gardens. It's original 16th-century hand-painted wooden ceiling and Renaissance-style furnishings allow you to experience the rich history of the building. This suite is your ultimate hideaway. 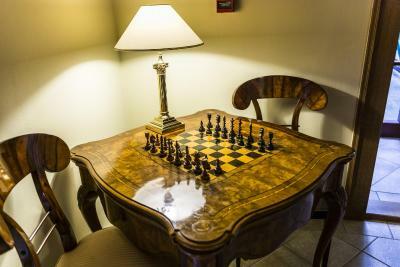 You can also enjoy an Apple TV and other amenities. Cozy yet spacious, these rooms have a sitting area with an Apple TV and a minibar. The bathroom has a bathrobe, free toiletries, a bathtub and a shower. House Rules Golden Well takes special requests – add in the next step! Debit card Golden Well accepts these cards and reserves the right to temporarily hold an amount prior to arrival. Golden Well accepts these cards and reserves the right to temporarily hold an amount prior to arrival. 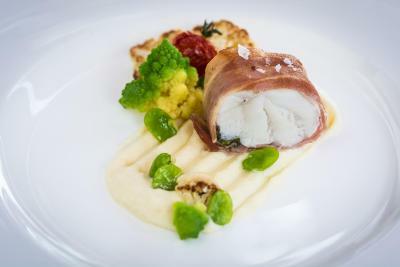 Please note that due to high interest in the restaurant, guests are requested to book a table in advance. Best hotel,perfect location. Loved everything! 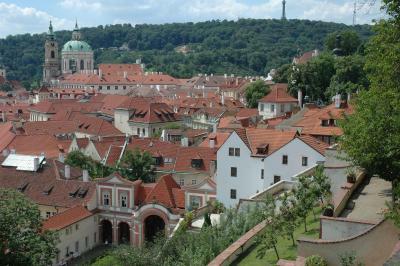 Golden Well is located at the top of a steep cobblestone road. It's part of the charm of the location, but hard on the feet and leg muscles--not the fault of the hotel. Word of warning: wear good, thick-soled walking shoes or boots. We should have liked more sockets for electrical gadgets (computers, tootbrush, phone chargers etc). Still water was left for us but we don't drink it, much preferring sparkling. These are trivial complaints after a wonderful stay. rooms were small and needed more drawers or shelves for clothing.